We all want the best for our babies so recommend you avoid harsh chemicals - Parabens, Lanolin, Sodium lauryl/laureth sulphate, Phthalates, Ethyl alcohol, Petrochemicals or Synthetic fragrances or colourants don't sound nice and can cause irritation due to their harsh nature. Be gentle, your baby's skin doesn't want to be covered in chemicals. Our products are organic and kind to baby. 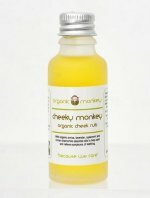 Our best selling Cheeky Monkey Organic Cheek Rub Oil for teething has helped hundreds of babies get through their teething pains - with 100% organic ingredients: Arnica, Sweet Almond, Olive and Sunflower oils with organic Roman Chamomile, Lavender and Spearmint essential oils to help calm and relieve the symptoms. New to Amber Pumpkin is the Myreen Young organic baby range - a great value range of organic creams and oils - suitable for vegans - all natural and safe for your baby! 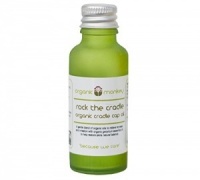 Cheeky Monkey Organic Cradle Cap Oil.